Surface studied by Meusnier in 1770. 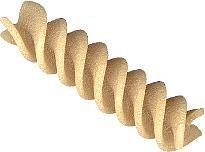 Other names: Meusnier helicoid, surface of the screw with square thread. 3) the coordinate lines of which are the curvature lines: . 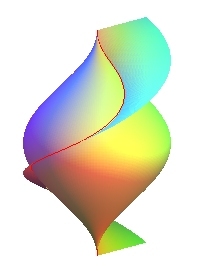 Total curvature: , zero mean curvature (minimal surface). Equation of the curvature lines: . 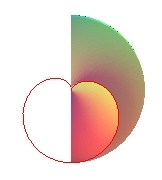 Equation of the geodesics : . 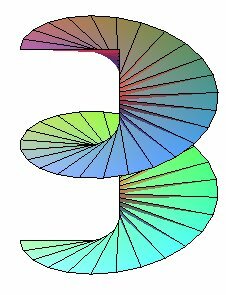 Area of a coil for a width a: . The right helicoids are the closed normal helicoids, in other words, those for which the generatrix is a line perpendicular (and therefore secant) to the axis. Therefore, they also are right conoids. 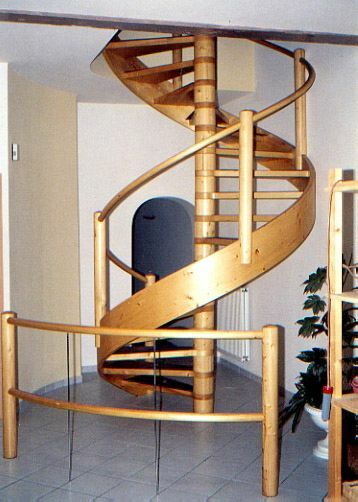 The right helicoid can be obtained as the union of the principal normals to the circular helix: . 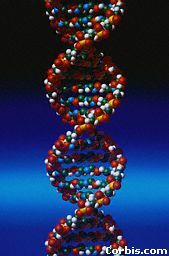 The intersection with a cylinder with axis Oz is composed of two circular helices images of one another by a half-turn around the axis Oz, right-handed if h is positive, left-handed otherwise (it is the double helix of the DNA molecule). 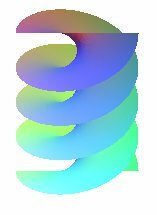 The second parametrization proves that the intersection between the right helicoid and a full cylinder with axis Oz and radius a is a translation surface (a helix sliding on itself); if Oz is vertical, then these helices are the slope lines of the helicoid. Compare to the revolution of a sinusoid. 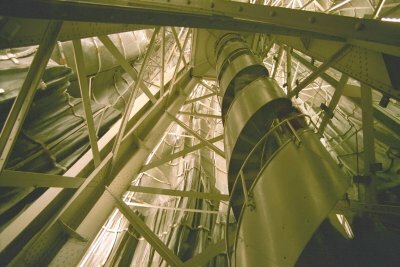 But there are other helices in a right helicoid, with vertical shift equal to half that of the generatrices: the sections by the cylinders passing by the axis! 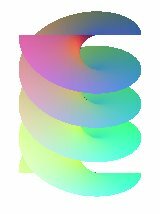 The right helicoid is, along with the plane, the only minimal surface to be ruled (Catalan theorem). 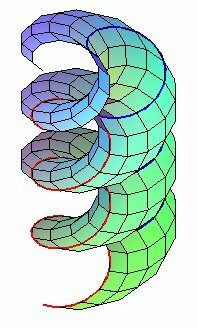 A right helicoid can be continuously and isometrically deformed into a catenoid, the surface remaining constantly minimal and of helical type. 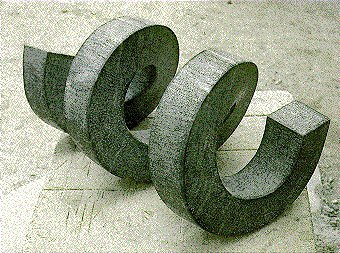 The intermediate surfaces are the minimal helicoids. In 1816 Gergonne asked how to split a cube into two parts by a surface with minimal area fixed to two perpendicular diagonals located on two opposite faces of the cube. though it is a minimal surface (but which does not connect at a right angle with the faces of the cube). The answer, given by Schwarz in 1872, is a non-ruled minimal surface the equations of which imply elliptic functions (on the right, the figure drawn by Schwarz himself). 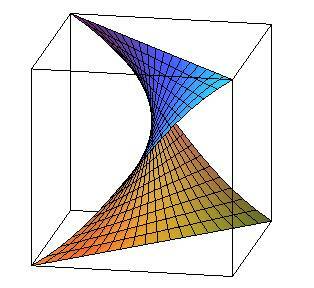 more precisely, the curve with polar equation in xOy : is the projection on xOy of the intersection between the helicoid and the surface of revolution . See also the Dinostratus quadratrix. 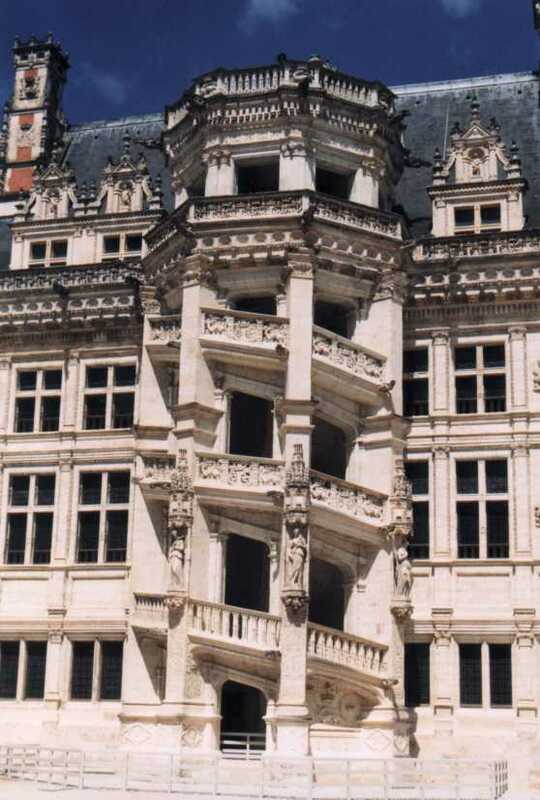 It is Leonardo da Vinci who had the idea of the double-helix staircase, that can be found at the Chambord castle: it is then a complete helicoid; it can also be found in the Statue of Liberty.